Electro-Fi Records tends to focus on the more established and matured artists of the genre. Snooky Pryor, Finis Tasby, Sam Myers, and Willie “Big Eyes” Smith immediately come to mind when you mention the label’s name. He is known to perform non-stop for several hours, so it is not surprising Songs of Vice and Sorrow is 74 minutes. The 16 songs' dreary topics (murder, robbery, drugs, gangs, and prostitution) aren’t anything you won’t see/hear on the evening news or prime time television. Thus, the album has been named appropriately. Fauth’s lyrics tell engrossing stories. Like a dramatic movie or long-running soap opera, you get absorbed in them. In fact, the lyrics are so lifelike, you’ll think he must have lived the lifestyles that he sings about. "Cobalt" features Fauth’s alternative and forward-thinking guitar combined with intense lyrics about hoboing on the Grand Pacific Train. Like a thief in the night, the piano darts away on "Running." Here, Paul Reddick’s harp is haunting. It is mystical how much music can be made by two gifted musicians. On "Big Brazos," his harp is moody and, like the song’s lyrics, a bit dark. Reddick’s harp is the featured instrument on "Highway 61," which includes a full band. David Rotunto blows his harp with soul, injecting energy to "Red Richard." "Suicide Note" explicitly depicts the mental state of mind before and during the act. On "When My Mother Died,"
Mel Brown’s blues guitar tone is authentic, but its effect – like Fauth’s fantastic piano – is bittersweet. The sad song is a tragic emotional rollercoaster ride, which tells a woeful tale that ends with a hopeful dream. A stronger instrumentalist than vocalist, Fauth’s warm voice is at its liveliest on the only cover song, J.B. Lenoir’s "Mojo Boogie." The reputable personnel also includes Al Lerman (harp), Wayne Charles (harp), Bob Vespaziani (drums), Sam Petite (bass) and Alec Fraser (bass). Essentially this is an acoustic disc, but it is not stereotypical Delta blues. “I play good clean barrelhouse blues,” says the young prince of the keyboards. Time and time again, he creates stunning melodies. You won’t tire of him or them. On this CD, you’ll hear distinctive American sounds by one of Canada’s brightest new artists. Along a journey from the finest rehearsal hall to the roughest juke joint, Fauth’s old-time New Orleans piano rocks like a bed in a brothel, while his lyrics are filled with the pain and misery that bore the genre. A modern day mastermind on piano, Fauth is retro and progressive at the same time. 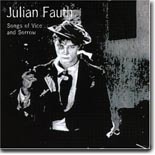 Julian Fauth is a very interesting, inspiring, and talented new find. His graphic lyrics may not leave you feeling well, but his novel music will. Just like Fauth, your feet will be stomping.